For other uses, see Anzoátegui (disambiguation). Anzoátegui State (Spanish: Estado Anzoátegui, IPA: [esˈtaðo ansoˈateɣi]) is one of the 23 component states of Venezuela, located in the northeastern region of the country. Anzoátegui is well known for its beaches that attract many visitors. Its coast consists of a single beach approximately 100 km long. Its capital is the city of Barcelona, and significant cities include Puerto la Cruz and El Tigre. Named after the great hero of Venezuelan independence, José Antonio Anzoátegui (1789–1819), this state has its own history. The city of Barcelona, which is the state's capital, was founded by Spanish colonists in 1677. The present Anzoátegui State was included within the Cumaná Province, which was itself part of the Captaincy General of Venezuela, along with some other provinces (Guayana, Maracaibo, Caracas, Margarita and Trinidad). In 1810, it was separated from the province. It was in 1909 that it acquired the present political distribution. 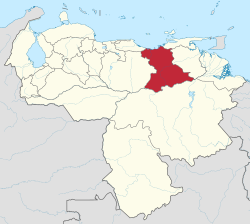 Anzoátegui is located in the northeastern region of the country and is bordered by the states of Monagas and Sucre to the east, Bolivar to the south, Guarico to the west, Miranda to the northwest, and the Caribbean Sea to the north. Based on the 2001 census information, the estimated population of Anzoátegui State in 2007 is 1,477,900 inhabitants. Anzoátegui's economy is dominated by Venezuela's principal resource: oil. It houses the "Complejo Petroquímico de Jose", one of the biggest petrochemical facilities in Latin America. However, Anzoátegui also has thriving fishing and tourism industries. Wikimedia Commons has media related to Anzoátegui.